Most of the farmers in India can no longer see a way out. ­The background to our setting up the project is that since 1995 more than 300,000 farmers have taken their own lives. For years they have been in the grip of the chemical manufacturers – 40% of their income now goes on genetically modified seed, chemical fertilizer and pesticide. They are almost completely dependent on the suppliers who buy their crops and deliberately drive down the prices. In some areas the soil is so exhausted that more and more artificial fertilizer and pesticide is necessary so everything can continue to grow “well”. The ground water, that is also used for drinking, contains fluoride and other chemicals, and the water table is sinking every year. If debts are added on top of that, or the monsoon fails, then it’s all over for them. It’s a desperate situation. The land, that the farmers cultivate by hand, is usually no bigger than 1 or 2 hectares. The competition on the global market makes things seem hopeless. Should these farmers give up? We want to help them regain their independence and food sovereignty and we hope you can help us too! The Village of Hope Kummarigudem will receive 28 dairy cows with calves. This will ensure they have a small additional income through the sale of milk. All of the farmers will receive training in the Zero Budget Natural Farming Method, a sustainable and natural way of farming. They will also receive advice from Indian experts who will help them when it comes to selling their harvest. We’ll help them to network locally and to build up long-term fairtrade contacts… We’re open to suggestions from you! Since most of the inhabitants have to drink heavily contaminated groundwater, the village will get a water treatment plant. A lot of people over the age of 40 suffer with severe joint pain. In February 2019 we will therefore be organizing another urgently-needed Medical-Camp in the village. These days you have to search for a long time to find a happy farmer. 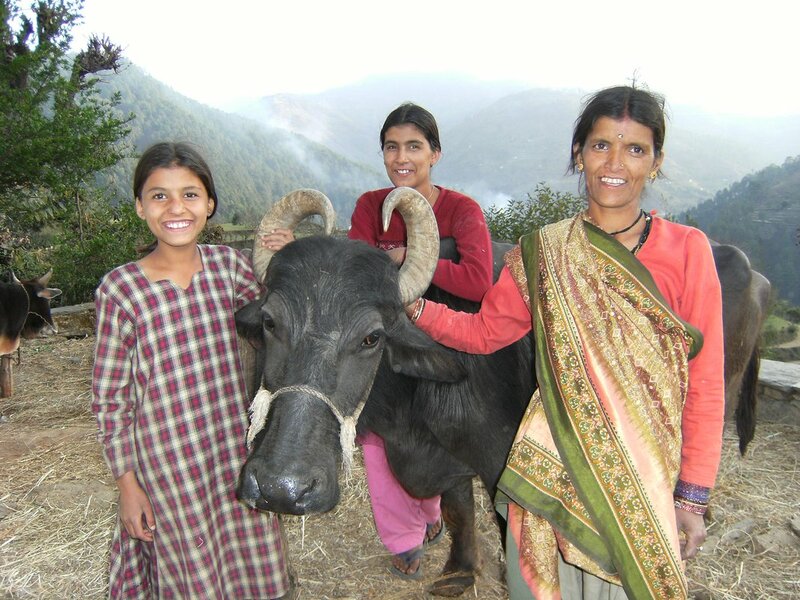 We met the family in the photo below in 2008 in Uttarakhand, North India. If we had a view like this overlooking the valley back home, we’d have a patio with sun loungers; here there is an enclosure for two cows. When the mother milks the cow, one of the daughters fans it with a twig so that it isn’t bothered by insects and remains calm. The family in the photo live at the foot of the Himalayas, still happy and contented.